Many churches today have a great need for photos. Pictures are used to create slideshows for services and incorporated into church websites. Few churches, however, are able to devote significant resources to finding and purchasing high-quality images. 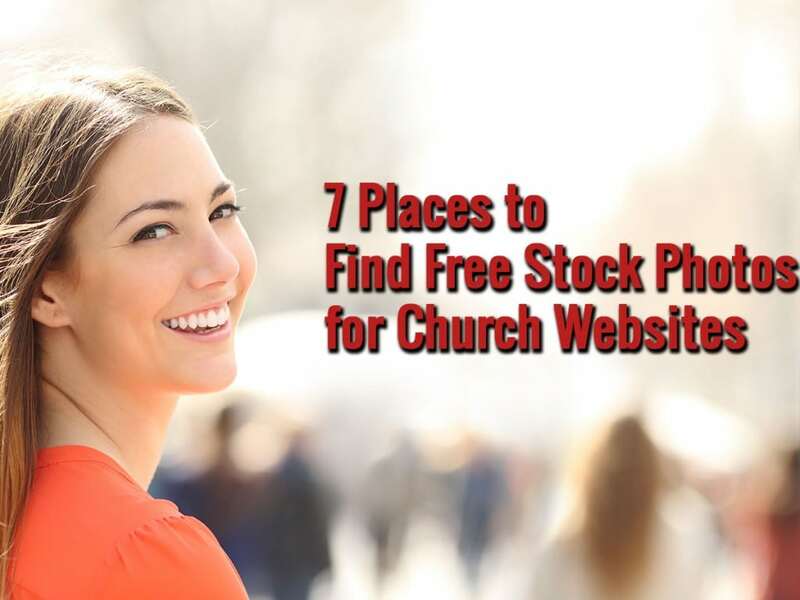 If your church is pressed for time every week and has a tight budget, here are seven places where you can quickly find free stock images. Wikimedia Commons is a Wikipedia-style collection of pictures. As a user-sourced encyclopedia of images, Wikimedia Commons’ collection is diverse in every sense of the word. Images are organized into many different categories, ranging from “Fossils” to “Jesus Christ,” and they vary in quality from poor to excellent, with most falling between so-so and good. You can either browse categories or search for a specific term to find a picture, but the site doesn’t let users search by image color, size or orientation like other sites do. Uniquely, Wikimedia Commons has many public domain paintings and pictures of sculptures, including religious ones. Sometimes, the encyclopedia is the only place you’ll find such images. Many images on Wikimedia Commons come from Flickr, which is another site that has user-generated photos. With about 1 million photos shared on Flickr each day, the site’s diversity is even greater than Wikimedia Commons’. It has all kinds of photos, at all quality levels and with all types of licenses. When searching for pictures on Flickr, you’ll want to restrict your search to the site’s Creative Commons section. There are several different Creative Commons licenses, but all of them permit some level of reuse. Determine which type of license your church would need, and then search the images with that license. Even if you don’t use photos from Flickr, the site’s Creative Commons section concisely explains the differences between the various Creative Commons licenses, which are used by many free stock photo sites. Flickr is one of the best places to learn about these licenses if you’re unfamiliar with them. Google doesn’t have a library of free stock photos, but the company’s search engine is one of the best at searching pictures. In addition to searching with terms, you can put a picture in Google’s image search bar, and it will look for similar photos. You can also restrict the results by image size, color and type. When using Google’s image search function to look for photos that your church can use, you’ll need to adjust the search settings. Under “Search tools” select “Usage rights” and set it to the appropriate license type (e.g. “Labeled for reuse”). The specific license type your church will need will depend on how the image is used. If you find an image through Google’s search engine, don’t take the search engine’s word that your church can use the image. Confirm the license type with the original source of the photo to make sure your church doesn’t violate a license, which is unethical and could have financial consequences. Freely Photos is a small stock photo site, but all the images on it are free–and it has a Christian focus. The site’s nine categories include collections like “Bible Study,” “Worship” and “Prayer.” Unlike some other free stock photo sites, all of the pictures on Freely Photos are truly high-quality pictures. Any picture on Freely Photos can be downloaded without an account. All images are published under the Creative Commons Zero license, which grants rights to modify and use the photos without asking permission or giving attribution. More details on this license are available on Freely Photos and Flickr. CreationSwap, another Church-focused stock photo site, is more robust than Freely Photos. CreationSwap has more than 2,000 free photos and vectors in dozens of categories. The site’s search function is also more advanced than Freely Photos, which only lets you browse categories. On CreationSwap, you can search for photos, videos, graphics and sounds by keyword, popularity and category. In addition to its free photos, CreationSwap also has paid and premium images. If you only want to look at free selections, make sure “For Sale” and “Premium” in the left search bar aren’t checked. You’ll need to create an account before downloading any picture from CreationSwap. You can make one for free, though. Picjumbo is a small collection of free stock photos from one photographer, Victor Hanacek. What Hanacek’s site lacks in selection and search ability it more than makes up for in quality. Hanacek is an excellent photographer, and you won’t waste time sifting through hundreds of poor photos and basic vectors to find a good picture here. Unlike Freely Photos and CreationSwap, Picjumbo is not marketed toward Christians or churches. Hanacek has many pictures that could be used in sermon series and on websites, though. For a small fee, your church can purchase a premium membership to Hanacek’s site. While not necessary, the cost is as little as $10 a month, and a membership lets you download images faster. MorgueFile is perhaps the most complete free stock image source. Similar to paid stock photo sites, MorgueFile has an impressive collection and decent search capabilities. Unlike Flickr and Wikimedia Commons, everything on MorgueFile is high quality. As you look for photos, you’ll see advertisements that lead to paid stock photo sites. You don’t need to follow these ads, as MorgueFile has lots of free stock images. Pictures can be downloaded without an account, but you may want to create an account so you can favorite photos and add them to your lightbox. Pikwizard has over 100,000 completely free images on the site, over 20,000 of those are exclusive pictures. They are also adding new images to their library daily with the ultimate goal to get to more than 1 million images. They’ve got A LOT of pictures of people, which tend to be rare in free stock photo sites. If you check out their site search for “office” or “meeting” and you’ll see the quality of the pics on the site. All of which are free to use without attribution. No matter what picture your church is looking for or how the image will be used, you should be able to find a suitable photo for free on one of these seven sites. There are lots of free stock photos available for churches to use, and these are the best places to look for them. If churchdev did your church website design contact us if you need help finding an image. We have accounts at several stock photo sites so we may be able to help find the image you need.